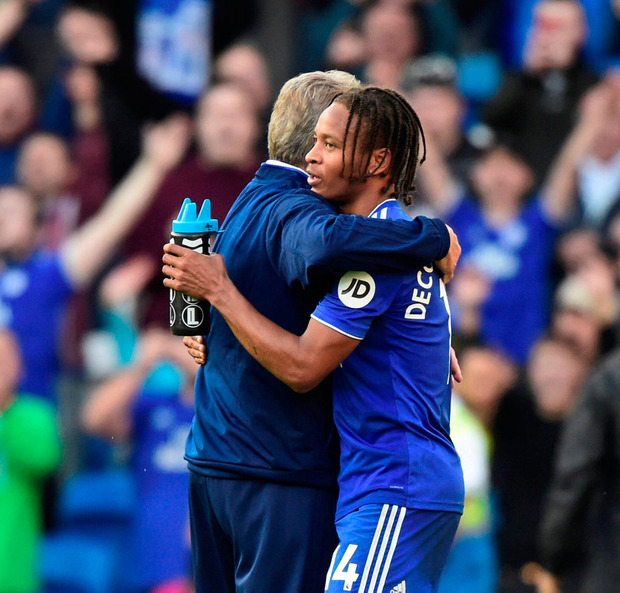 Bobby Reid has described how Neil Warnock's mind games are giving Cardiff hope of Premier League survival. Cardiff moved out of the relegation zone by beating Fulham 4-2 on Saturday - their first top-flight win since April 2014. Veteran manager Warnock had raised eyebrows before the game by saying he would not put money on Cardiff staying up this season. But Reid insisted those comments should not be taken at face value and were designed to shield the players from outside pressures. "He jokes about stuff in the press that takes a lot of pressure off us," Reid said after opening his Cardiff goal account following a £10million summer switch from Bristol City. "He has the media talking about him and his comments, and then we go out and perform like that. "We take what he says with a pinch of salt because it helps us. "We know if we can play our game like that we can stay up easily." Reid had gone over eight hours without a goal for his new club when his big moment arrived in the 20th minute with the score at 1-1. He capitalised on Tim Ream's error to slip the ball through the legs of Fulham goalkeeper Marcus Bettinelli and his joy was palpable. "It was a relief for me," admitted Reid, who joined Josh Murphy, Callum Paterson and Kadeem Harris on the Cardiff scoresheet. "As a forward player you can't dwell on it too long because it can eat you up. "You've got to keep getting in the right positions and getting the chances. "This a massive win for us, but we know that we're good enough to win games and compete in this league." Cardiff leapfrogged Fulham on goal difference and the Cottagers' slide is now taking on alarming proportions. Fulham have lost four of their last five games and their 25 goals conceded from nine matches is the second highest at this stage of the season. "We have to change our mentality," said Germany forward Andre Schurrle, who had opened the scoring with a sublime 30-yard effort before Ryan Sessegnon equalised to make it 2-2 at half-time. "It's now a pattern for us in every game. We have good moments and we score and get in front, but it doesn't take us long to get a knock on the head and we concede. "It's the same thing every week. The goals are too easy for opponents. "Everyone was quiet in the dressing room afterwards, because we know it's not easy to get out of the bottom three. "The next two games against Bournemouth and Huddersfield are crucial and we have to pick up points. "Otherwise, if we need points at the end it is always very difficult."